Cash Prizes will be awarded to the best in each class and a runner up. Judging will be by popular vote. This event is open to the public. There is a $5 fee for tasters. 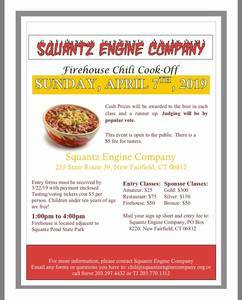 Entry forms must be received by 3/22/19 with payment enclosed Tasting/voting tickets cost $5 per person. Children under ten years of age are free!